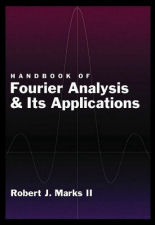 "For all your Fourier needs"
Marks's Handbook of Fourier Analysis and Its Application handbook will appeal to professionals in engineering, computer science, statistics, and applied mathematics. It can replace several less comprehensive volumes on the subject which are often used as textbooks. In addition to being primarily used as a professional handbook concerning Fourier analysis in continuous and discrete time, the handbook includes sample problems and their solutions at the end of each section. The handbook can serve as a text for advanced undergraduate students and beginning graduate students in courses dealing with multidimensional systems, signal analysis and synthesis, Shannon sampling and interpolation theory, fractional Fourier transforms, time-frequency representations, linear transform theory, Hilger time scales, random variables, stochastic processes and linear systems. Crisp prose are clearly illustrated with 440 figures. Besides the Fourier transform, consideration is also given to Abel, cosine, Hankel, Hartley, Hilbert, Laplace, McClellan, Mellin, radon, sine, Walsh, and z transforms. Applications considered include boundary value problems, diffraction phenomena, quantum mechanics, finance, stochastic resonance, lost sample restoration, image compression, tomography, subpixel resolution, multidimensional filter design, motion blur correction, solution of wave equations, western music structure, conformal radiotherapy, quantization error correction, modulation, and beamforming. The powerful signal synthesis and restoration method of alternating projections onto convex sets (POCS) is also developed. In this 800 plus page volume, Marks's treatment of Fourier analysis and derivative operations such as convolution is both broad and complete and has application to an astounding array of areas in science and engineering.